Now that I have Animal Crossing: New Leaf, I figured some of you might want to exchange friend codes. Mine is 1805-2560-5684. I’ll probably open my town gates some time after 6 PM tomorrow, if you want to come by. My town’s native fruit is the orange, by the way. Post your code in the comments so I can add you in return. It might be best to post your 3DS name as well, or else try sending me a message through your 3DS with your username from the site. Whichever you feel most comfortable with, I guess. I liked these guys but they’re probably never going to show up again. ASDFGH- she called him a wuss. XD I like the pair too! Do they have names? Lindsey: FC is 3523-2065-4619 …you’re welcome to add me if you’d like! You (or Captcha) can name them! Ha! The Rupee is a wallet. I can see that; Link in the games is just finding people’s wallets in the grass and emptying them. What could he be selling anyway? There’s a pocket for gems, sure, and there’s something yellow and coin-like. Now if only I could remember which was the Ide! Perhaps he’s doing illegal currency exchange; Ide to Doubloon or something. They have interesting houses in this town. I guess you could say it’s a colorful neighborhood . Haha, actually it’s just a big jewel she’s looking at, BUT she is kind of holding it as a wallet, and HOLY CRAP a wallet that looked like a rupee would be the best thing. Ides are coins, but I don’t think he’s selling money. 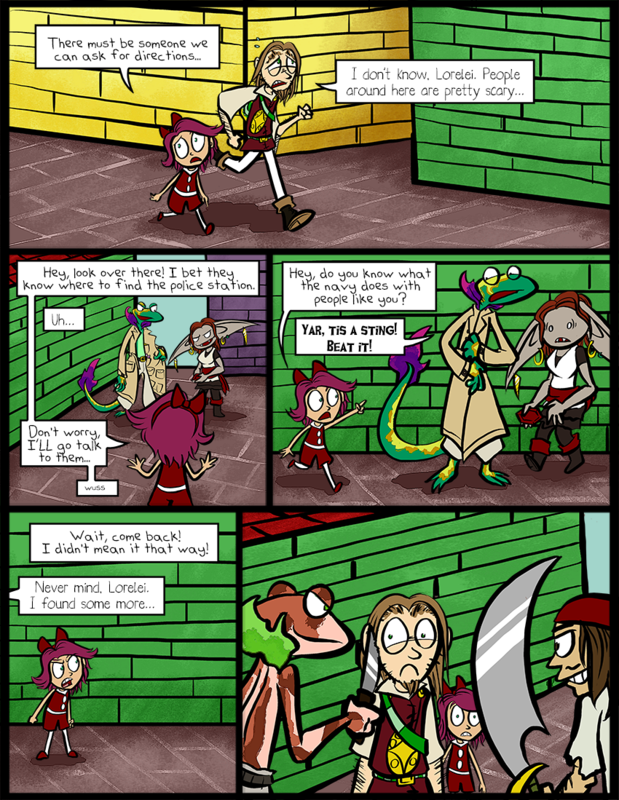 ^_^; Those are probably exotic coins plundered from foreign shores. Good collectors’ items! In the Caribbean they often paint their houses in very joyful colors like this! sorry but lorelei face has gotten less cute over the year it was cute now it is very complicated it is kinda funny. it lookes more like a guys face kinda rough. you know. but its still a good comic. werenerd was… kinda like, weres waldo? Thanks for being honest! I don’t want to go back to it being perfectly round, but I’ll see what I can do as a compromise. “Hey, do you know what the navy does with people like you?” That sounds so racist/speciest. I’m sure that’s a common problem around Ideneau though. Of course the flish-controlled navy would totally throw salamandrians in jail on the flimsiest excuse. I like that coat, it’s filled with rupe– I mean, colored gems. What are they worth there? Rupees are worth a lot less than Ides. They’re suffering some crazy inflation, what with them literally growing on trees (well, almost… grass and bushes, though, definitely). Jeez, way to just jump into their deal making with those unsavory inquiries… Besides, how do you go from where is the prison to you’re going to jail? Silly Lorelei, that isn’t how you ask questions. I love how it kinda looks like that dagger is grazing Cyril’s cheek. Did you switch his face back to the more rounded look? I don’t actually have that game, or many for that matter on my 3DS… However, if you want my FC anyway it is 0275-7774-8243. Feel free to add me. If you want. Your choice. I suppose my name would help… I am new at this. I have no friends, with a 3DS that is… They are all poor. DAMN THEM AND THEIR LACK OF DISPOSABLE INCOME. The pirate totally just wants to give him a shave, and possibly a haircut; he needs it. Didn’t intentionally switch back, but because we’re viewing him from the front I didn’t go as triangle-mode as I’ve been doing. Victor tells me it’s funny, though. And yes, I’ve been considering doing that! There’s stuff you guys make that isn’t exactly fanart but it’s funny and deserves to be seen. It is the merchant from Resident Evil 4… He does that whole trenchcoat thing. look it up some time. “Yar! ‘Tis a sting!” is probably the best line ever. I’m the person around here in charge of “making the script piratey”. Captcha’s suggestion for names are March, and Applowsn. ahaha, it’s great to see Cyril out of his comfort zone. And to think he wanted to follow Skarva around in the first place. Captcha wants one of those pirate characters to be named Ntoritb. I think bards tend to feel safe and happy as long as they have *someone* to follow around. He’s so lost at the moment because he doesn’t. I guess he’s defaulting to letting the tiny child take over, actually. The current area they’re in is like, awesome character design central. Seriously, so many cool ones! Thanks! 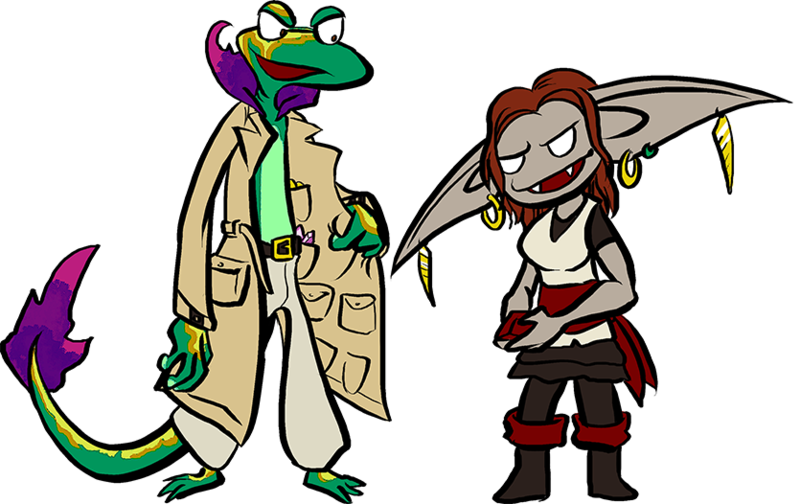 It’s certainly a lot of fun to draw pirates, and so many salamandrians and flish are challenging me to come up with new color schemes that I haven’t used before. C’mon Cyril, DO SOMETHING. Don’t make me feel stupid for having faith in you. Also, my name’s Hadley and I’m 0834 1353 1307, if you don’t mind me being dead silent the entire time. If I can find the time to wifi, I’ll bring you some lemons in exchange for the oranges. I can bring you apples or cherries if you want! …i might have peaches later today too, so, yeah! I’m also awkward at visiting villages, so, no worries. THAT GOES FOR VICTOR TOO. Yeah, it’s just that I’ve never wified with anyone who wasn’t in the same room as me, and I have this weird social phobia where I’m sorta uncomfortable until I see how people act in a situation. You just go around giving people lemons. Like life. Except in this world lemons can give you money. I am doing you a service. The same way how when life gives you lemons, the lemons give you experience, which can be used later in life. Respect the lemon givers, man. I seem to have pears for a town fruit. Come join me for some pear giving action! It apPEARS you have pears. “Pear giving action” is that a euphemism? Hahaha, it does, doesn’t it? Trust me, I know. Everyone over here at the lemon givers association has had their house burned down AT LEAST twice. Well, I won’t burn your house down, I like lemons… Add me, I have loads of pears!